The Black Holes which astronomers encounter can be of two kinds. The first has a mass a few times that of the Sun and is produced in the final explosion, called a supernova, of a fairly massive star. The second kind is enormously more massive, perhaps a few hundred million to a few billion times the Sun's mass. This latter kind are called Supermassive Black Holes. 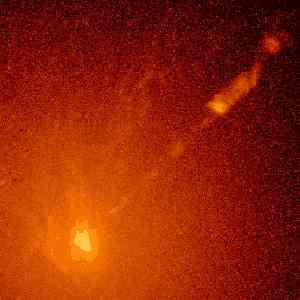 Supermassive Black Holes are thought to exist at the centre (the nucleus) of quasars. Their enormous gravity increases the velocity of stars and gas clouds orbiting the nucleus of these galaxies. One way in which Supermassive Black Holes may be formed is that a normal sized Black Hole at the centre of a galaxy swallows material over millions of years and slowly increases in size. Another possibility is that many individual Black Holes may merge and so their individual masses combine to form a Supermassive Black Hole.